Ahhhh it was so good to open and read the first few pages of The Promise and find myself back in the world of Gary Goodhew – I’d missed him! If you are reading this review and haven’t read the rest of the series, although The Promise is great I urge you to read Cambridge Blue first and work your way through from the beginning. Although I’m sure each book can be enjoyed in its own right I think there are definite advantages to be had from understanding Goodhew’s personality. This can only really be achieved by reading each book in turn as layer upon layer of his psyche is revealed. Having said that, I felt The Promise focused much more around Gary and the reasons behind his aloof persona. It was great to uncover a deeper understanding of who he is and why he acts the way he does sometimes, his tenacity, determination and compulsion to not only solve but understand a case are traits that all detectives should have. Wouldn’t it be wonderful if there were real detectives out there who operate in his way, ok so a few rules are bent here and there but we could certainly all sleep safe at night in the knowledge that a Goodhewesque police force was on patrol. I loved the references to Cambridge throughout the book – whenever I go to Cambridge I tend to park in the Queen Anne carpark, for years I’d been doing so without really noticing the buildings around me but now having read the Cambridge Blue series I’ve learnt so much more about Cambridge too and I can’t help walking across Parker’s Piece with a wry smile as I spot the police station, the swimming pool and even Goodhew’s house! As ever, the author’s knowledge of the area shines through. The Promise has an original storyline with some fascinating insights into a world just below the surface of normal society, a world that we are all aware of and yet mostly fail to notice on a daily basis. The victims in this book by and large are seen to be invisible which gave me pause for thought. The concepts regarding the garages (without wishing to give anything away) were a real eye opener. I wonder if the Bruce has any fans in the police force who will have read The Promise and added ‘garages’ to their to do list? I like to think so. A tiny hint of a love interest. No no no, the lovely Alison Bruce knows I object to this but no matter how much I prefer him to be strong and single, I guess we can’t have poor old Gary being alone and unloved…can we. I was sad to reach the end of the book. I knew the story was over, it had be cleverly and succinctly wrapped up, but I so enjoy reading about Gary Goodhew that I wanted it to continue. Most books you reach the end and look forward to reading something different, no matter how book the one you’ve just finished was, but there is something about the Goodhew character that just makes you want to read more. Alison Bruce has excelled herself with The Backs, it knocks its predecessors into a cocked hat as far as I’m concerned. 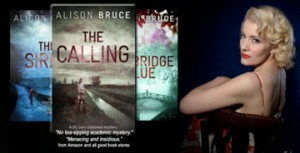 As a fan of the Cambridge Blue series I have always tried to view each one with impartial eyes and review it honestly on its own merits and not because I think Alison is a cool lady; I think my previous reviews have been critical when needed which hopefully reflects that my opinion is unbiased. The Backs focuses less on building the reader’s relationship with Goodhew (which is fine as we know and love him enough already) and more on building a really engrossing story with excellent characterisation of the main protagonist and all ‘bit players’. I really enjoyed the scene setting and descriptive writing which also seemed to have upped its game in this book, so as well as getting a really good detective story you also get a beautifully written and engaging tale that leads you through the streets of Cambridge in glorious detail. As I live near Cambridge and visit often, this was an added delight for me and I really enjoyed spotting Gary’s row of houses view it’s view across Parker’s Piece to the Police Station and catching a glimpse of CB2 which is now on my list of must visit places. All in all an absolute success and genuine pleasure to read. I love that it ends with a big fat question mark over something and particularly enjoyed the italic line on page 243 although maybe not quite so much as I enjoyed and appreciated the name check I got on the acknowledgements page 🙂 featured here with the glamorous hand of Ms Bruce!